Last year I lost 12 kg over 3 months, by following the advice of two books. Eat Fat Get Thin is one of them. The other is Michael Moseley’s 8 Week Blood Sugar Diet, and I will review that at a later date. The title of the book allows you to do exactly what it says. Of course you need to eat the right fats, and this book tells you which ones they are. Mark Hyman solved many of his own health problems by changing what he ate. Before you go any further, don’t think this is a green light to eat a high fat diet that includes takeaways and pork scratchings! Fat helps loose weight. It is fundamental to a healthy, functioning body. All our cells are surrounded by a membrane of fat and protein. Without these nutrients our cells cannot function properly. Fat from foods actually can boost your metabolism. Not all calories are created equal. Some calories make you fat and sick, while others make you thin and healthy. Sugar is the new fat. This is what we a frequently hearing in the press these days. That includes white carbs – just another word for sugar. Low-fat high-carb diets actually make you crave more carbs. Eating saturated fat does not cause heart disease. In fact coconut oil is a great example of a saturated fat that’s great for you. And you can even have some butter! The evidence is in the book, and explains what does cause your arteries to harden and narrow. Just because you workout a lot, you don’t need a carb-heavy diet. Make sure you’re getting enough, good-quality protein too. 1. It’s based on scientific evidence. The first half of the Eat Fat Get Thin book is basically dissecting the science and the evidence. If you don’t like this sort of stuff you can skip to the Eat Fat Get Thin Plan. But I love it how the author explains why we have adopted our current diets. Be aware of the politicians and the infuencers, who we are led to believe know what is best for us. 2. It advocates a lifestyle, not a diet. Diets don’t work. Lifelong habits do. 3. It’s practical. 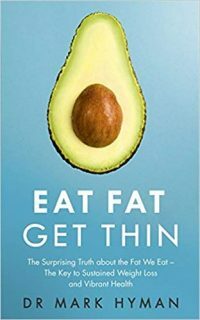 The Eat Fat Get Thin Plan is packed with easy tips to upgrade your food regime and the recipes are accessible to anyone with basic kitchen skills. 4. You don’t need to count calories. As long as you’re eating the right foods (in the right sort of proportions) you’re fine. You shouldn’t feel hungry if you avoid the white stuff! 5. It recommends you eat more fat! This one is pretty self-explanatory. And it makes me really happy – avocados, olive oil, eggs and even a little bit of butter. For a book with a lot of science it is still an easy read, you don’t need a degree in Latin to understand. There are a lot of recipes at the back of the book, which are healthy, tasty and filling. You should be able to find this book in your local library, or you can buy it from all good bookshops such as Amazon.